From the reviews I read, I could tell that this is a really good game. So I downloaded it and gave it a test. Good was an understatement. It was awesome! The music was great, and the ability to play as three different characters---totally sweet! The graphics were O.K., as this was based off the Doom engine, but they could have looked better. The only problems I had was with the enemies and the ring\shield boxes. First, the characters and the enemies weren't really 3-D, but more of flat images representing different angles, like in Doom. 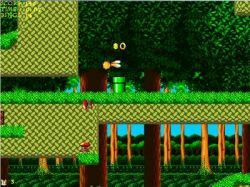 This caused a slight problem in the collision detecting when "bopping a baddie", as Sonic & Co. could easily miss or go through the enemy. The same thing applies to the ring boxes. It was really hard to break them, as you could easily jump over them as if they were pieces of cardboard, and miss the top of the box. 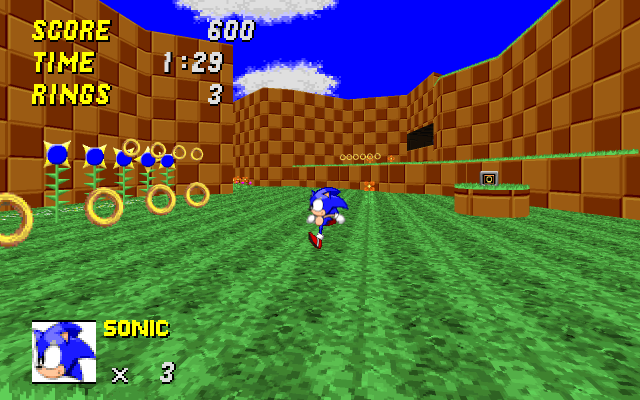 Otherwise, this 3D Sonic game is one of the best! I love this game because of how entertaining it is. I think that everybody in this whole universe should play it and that includes all of the oldies. Me and my sonic buds always play together at recess and the whole idea is of all of the sonic games. I love sonic and I wish that I can meet him someday!!! Oh man would that be a special day to me... So just to tell everybody that has not played this game...you are soooooo insane and I am going to come to your house, download it, wake you up if you are sleeping and make you play it and never get off. Well of course you think I am a crazy loonatic but I'm really just a huge fan for sonic and all his friends and enemys. So if you have not played or heard of this game then come on to me and I will make arrangments. I'm just kidding but you should really play this game!!! The game has me stunned! 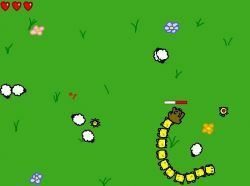 I have never seen a better game! The 3-d factor makes it even better. The only downfalls are the turning and the 2-d characters. Other then that it is stunning! This man took his time on it. I played as Knuckles to see the edges. I have to say that he did an amazing job there too. He took the time to intertwine the areas and to give secret areas all over the map. I spent 30 minutes in one area looking for the exit! He hid the items well. He even made currents of water push you! He left no detail out and no corner left alone. He gave the enemies an intelligence. One followed me half-way across the map! I give this game a B+! The best 3D game I've played so far. Although it could do with a few more levels. Its just the graphics that are not good, but other than that it is wicked and it even has multiplayer mode were there is a spilt screen like on a racing game on PS2 or a XBOX. It has a match mode where both players have to kill each other with either there rings or the special weapons or the power ups like the red one witch will leave a trail of fire or the grey one where when you activate it will damage enemies (or players) within a blast radius. Find out about the other modes and weapons by downloading it. Its awesome. This is like Sonic on GameCube! The game is excellent. This is a high quality game. I like it because it's 3D and the graphics are not so terrible. I like those small animals in cages, how they are looking at you and asking “Will you free me please?”. You need this game if you are a Sonic fan. It is like you are playing on a GameCube. 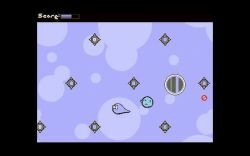 And I would like this game to be updated with Chaos. That would be the great. Sonic's way of moving is very good. I like when he is kicking enemies. But, I have to say my favourite character is Shadow. Download this game. It is worth it. Sonic 3D Robo Blast 2 is a great way to pass the time! choose between Sonic, Tails or Knuckles and have fun! in every third act you will verse the evil DR EGGMAN!! careful! Dr Eggman has been after Sonic and his friends and if you lose, Dr Eggman will finally have his revenge! Multi player is also fun! If someone else is on your internet connection and is on Sonic then vs. them and show your enemy who is boss! So I think you must join this non-stop fun and action and download it today! And in single player you don't need an internet connection! Download it today! 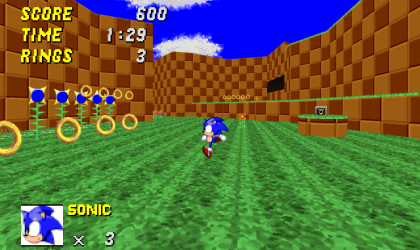 Sonic 3D Robo Blast II is a great 3D Sonic freeware game in which you can control Sonic, Tails and Knuckles. They each have special abilities, like Tails can fly, Knuckles can glide through the air and Sonic can, well... run really fast. Anyway, the graphics are awesome (most 3D games have nice graphics) but the controls for the game are a tad bit confusing. Overall, Sonic 3D Robo Blast II is a great game and worth the download (which takes forever, mind you) and I suggest you download it.